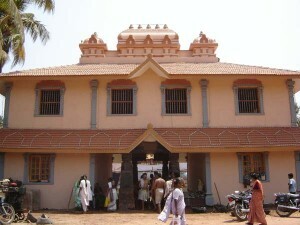 Mulki Bappanadu Durgaparameshwari Temple is situated on the banks of the Shambhavi river and was built by a Jain king, as per the wishes of a Muslim merchant. History has it that Bappa Beary was responsible for the construction of this temple. Locals have an interesting story to tell about this merchant. When the merchant was travelling across the Shambhavi, his boat came to an abrupt halt in the middle of the river. While examining the cause, he found blood spread over the river water and felt a deep sense of fear. Local myth has it that he was then ordained to construct a temple with the help of Mulki Sawantha (a Jain king) and get Baila Udupa (the priest) to perform a pooja to the deity. And so, the Bappanadu Kshetra came into being. Even to this date, the temple prasada issued on the very first day of the annual festival (Brahma Rathotsava) is sent to the house of Bappa Beary. 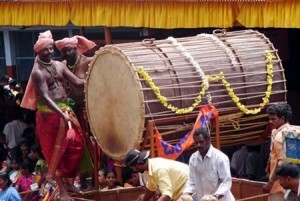 The beating of the drum (Bappanadu Dolu) during annual festival is another key feature of the celebrations here. The Bappanadu Dolu is very popular among the local of this region. How to reach: The Bappanadu temple is located on the Udupi-Mangalore highway (NH 17). There are plenty of private buses available to Mulki and Udupi from Mangalore and tourists can alight at Bappanadu. This entry was posted in Holidays, Karnataka, Temples and tagged abrupt halt, banks, Bappanadu, Bappanadu muslim merchant, Bappanadu Temple, beary, buses, celebrations, deep sense, deity, dolu, Durgaparameshwari, features, highway 17, histories, interesting story, king, Mangalore, map, mulki, Mulki Bappanadu, Mulki Bappanadu Durgaparameshwari Temple, myth, pooja, private buses, river water, route map, sense of fear, temple, tourists, travels, udupi. Bookmark the permalink.